If you've got nothing to do this Sunday (or if you've got something else to do, you can cancel it of course), get along to Kidderminster to the Boar's Head on Sunday for one of the most exciting literary events you'll enjoy so far this year! Unfortunately due to family commitments, I can't attend, but someone will be reading an extract from one of my stories. In December 2013 Black Pear Press launched its first publication, Short Stories from Black Pear: an anthology reflecting the diverse talents of people living and writing in Worcestershire, the Black Pear County. It was the run up to Christmas, so it's just possible that you were double booked that day and you've been kicking yourself for missing it. Well, here is another chance to catch some real writers reading the stories that they … err … wrote. If you're impressed by what you hear, you might even want to buy a signed copy of the anthology. 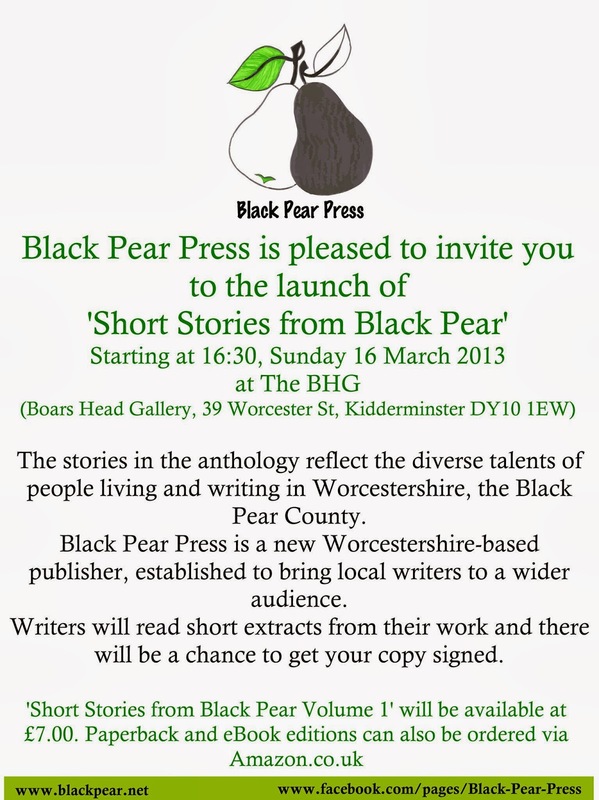 You are invited to Short Stories from Black Pear, 4.30 - 6.30 pm, Sunday 16th March at The Boars Head, 39 Worcester St, Kidderminster. (Entry is FREE). If you can't make it, and still want to buy a copy, head on over to Amazon.